First Line:"Finn "Lucky" Leold was murdered in the street." 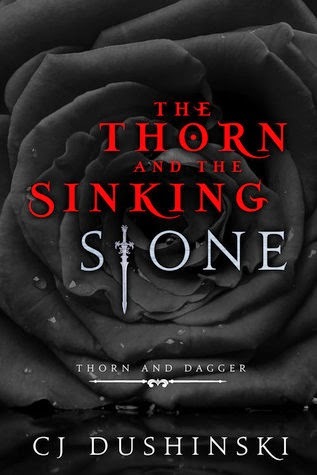 Review: The Thorn and the Sinking Stone was a pleasantly surprising read for me. I saw a whole lot of it being compared to Romeo and Juliet so I was expecting insta-love and both characters killing each other off etc luckily that wasn't the case. This book had to do with warring family gangs, in this one it specifically focusing on the Daggers and the Roses. It's also set in a dystopian world where there are people who have powers and there were bad-asses riding motorcycles and a "Princess" who knew how to wield a Katana and see seconds into the future. As far as the romance aspect of the book, I don't want to call what Sebastian and Rose had was insta-love just because they had a brief history together from a moment they shared when they were kids and because of that they were hesitant to kill each other off when pitted against the other by there families. Nor were they trusting of each other in the beginning either although deep down they both held on to a memory that made them care for the other. I personally loved the two together. There is another aspect to the story that made the book interesting which was the Cursed people. That is what the government called those with special abilities. If one was found to be Cursed they were hauled off by the Watchmen and imprisoned and a good chance killed depending on a few things. I do wish we learned more about the Cursed in terms of what happened to them after they were captured we only saw bits and pieces of it so I didn't feel that part was developed well or maybe there is going to be a second book and we will learn more about what happens. Now on to the world building, I wish it was more developed, I get that they lived in Rain City but I wanted to know more about it, who ran it for example. Yes you have the four gang royal families but they don't actually run things so who controls the Watchmen? Who in government is behind it all? Also would have loved to know more about the culture in Rain City it felt like we were just thrown into it. Then there was the Cursed, what happened that some have special abilities and how did they let people who have none overpower them. Honestly there are a lot of questions that were not answered at all and the world as a whole needed some serious in-depth development. Minus the world building issue I had, I actually enjoyed the book for what it was. I liked the dual point of views, that always helps me connect with the characters better, I liked that Valencia was a strong heroine and Sebastian was a good guy and they both were complex characters that were very likable. Overall it was a fun read and hopefully if there is a second book which I'm assuming there is with the way it ended, that things will be more developed and thoroughly explained. ~"Life is complicated enough with love, best leave hate well enough alone." ~"Our reality was this: we were enemies caught in our parents' war, trapped in a desperate situation where desperate people did desperate things."